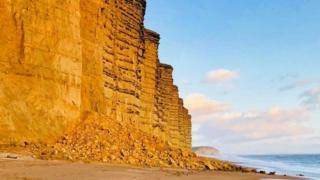 A section of beach that featured in the ITV crime drama Broadchurch has been shut after a large cliff fall. About 1,000 tonnes of rock and debris fell at East Beach in West Bay, Dorset, at about 17:30 GMT on Tuesday, the coastguard said. Following searches by coastguard teams, fire crews and rescue dogs, no-one is believed to be trapped in the rubble. The Jurassic Coast path and beach between West Bay and Freshwater have been closed. Engineers and a geologist are expected to inspect the area later. West Bay featured in ITV series which starred Oscar winner Olivia Coleman and David Tennant.